I blogged a couple of months ago about launching Cyborg Camp here in Toronto, and I'm here to report now that it actually happened last weekend! 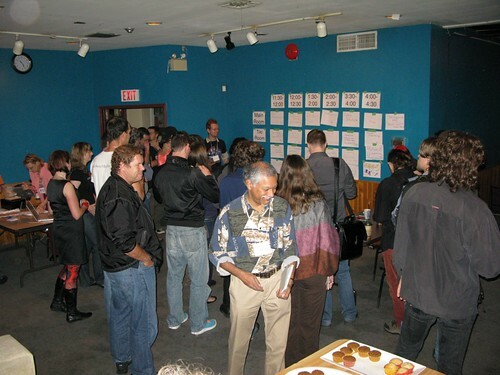 We had about 40 people gathered at Tranzac, the Toronto Australian New Zealand club, to talk about cyborgs, augmentation, transhumanism, AI, hackerspaces, all that kind of good stuff. I really enjoyed myself, and several other people told me they did as well, so I'm counting it as a huge success! I certainly learned a lot about how to put together an event and how much work it actually is - although an unconference is less work than a real conference, it's still many hours and days of work! I especially enjoyed the "libraries and hackerspaces" session, and the telepresence robotics session, and the ethics of duplicating people session. We're planning to do Cyborg Camp again next year here in Toronto, likely in the fall again, but long before then I plan to start up a cyborg/H+ discussion group, which will be a lot of fun. Anyway, thanks to everyone who came to Cyborg Camp, and thanks especially to my co-organizers Jen & Alan. Check out the flickr set: Cyborg Camp Toronto.